Students from South Side High School tour LyondellBasell's Jackson facility during Manufacturing Day. Students from Jackson-Madison County Schools were part of 23 area high schools that participated in Manufacturing Day, coordinated by Jackson State Community College (JSCC) and the Jackson Chamber on October 20. Manufacturers from Henry to McNairy County held tours and informational sessions to educate students about the skills needed for today’s jobs. “The goal for this program is to promote modern manufacturing and expose students to great career options,” said Vicki Bunch, manager of workforce development, Jackson Chamber. The event attracted more than 250 students total to facilities in the area. 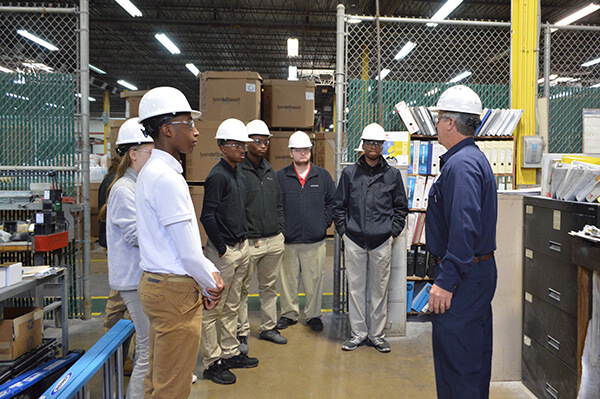 An additional 100 students were educated with industrial tours on October 6. South Side High School students toured LyondellBasell, a global company that manufactures plastics, the bulk of which are supplied to the automotive industry. Students gained additional insight into a typical workday from Andrew Pettit who is a maintenance apprentice that graduated from the Advanced Maintenance Technician (AMT) program at JSCC. He is working his way through the company to become a Maintenance Technician. Luis Mendez and Grant Young, both students with JSCC’s AMT program, were on hand to talk with the students and offer their insights. Mendez is working at TBDN Tennessee Company, while Young is set to start in 2018 with LyondellBasell through this program.